(From L-R) Ma. Cecilia Domingo, Meralco Sr. AVP and Head of Biz Partners Group; Alfredo S. Panlilio, Meralco SVP and Head of Customer Retail Services and Corporate Communications; Harvey Ong, Alfamart CEO; and Subrata Tedjosukmono, Alfamart SVP for Business Development and Construction. 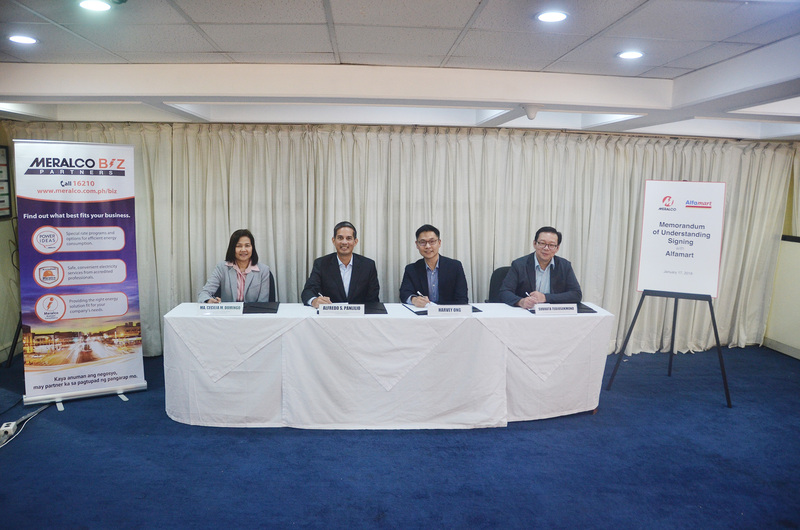 Meralco and Alfamart recently held a Memorandum of Understanding (MOU) signing to formalize an already strong partnership. Alfamart, a primarily franchised chain of convenience stores from Indonesia with over 350 stores in the Philippines, is a mini-market concept which combines elements from both convenience and sari-sari stores. The Meralco Biz Partners helped energize over 300 Alfamart stores in the Philippines and because of the quick energization, the time from start of construction to energization was reduced by about 45 days per store, resulting to an average savings of PhP2.25M per store. The MOU lays down the areas of cooperation and collaboration with respect to the strategic partnership aimed at helping Alfamart in the expansion of its stores, in line with Meralco’s thrust of providing its customers with the best value in energy, products and services. Meralco is committed to meeting Alfamart’s goal of having 600 stores in the Philippines by 2018.